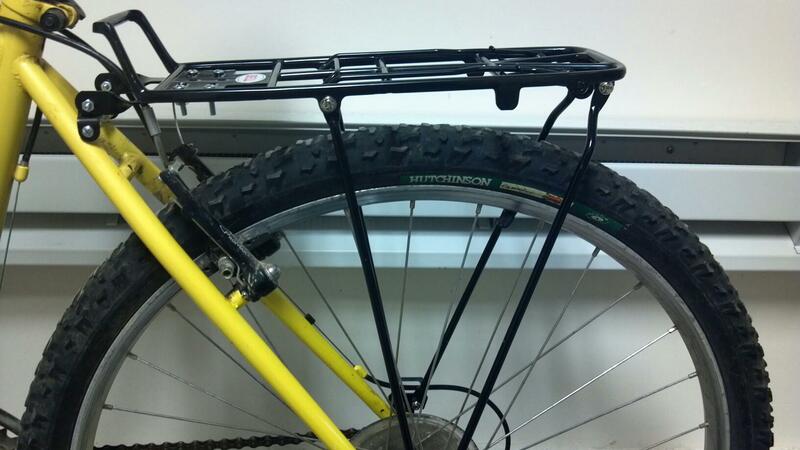 As I mentioned the other day, I am super excited for Spring to arrive, and to be able to bike to work. Sadly, my work schedule for the next month is the up-most definition of insane, so I do not know how much serious biking (or blog posting) will get regularly done. But the days I get to make me smile. 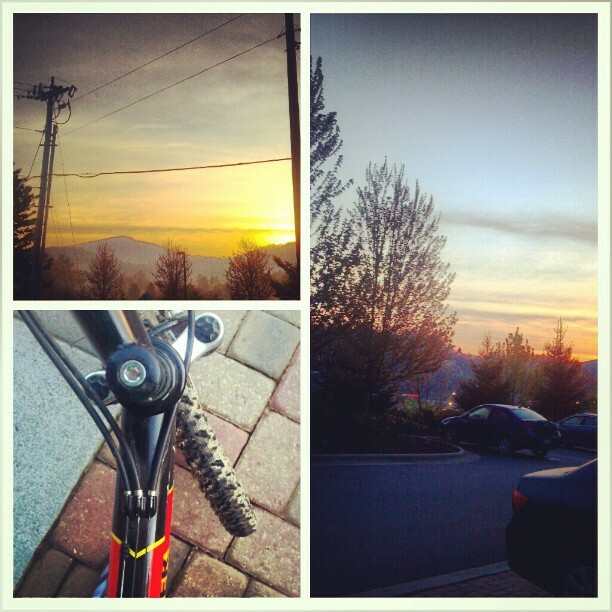 I thought I would write you a little post on ‘How I’ bike commute. I am seriously no expert – because I’ve only been doing this all of … twice. But, I’ve done a lot of research this week, and, for now at least, I have a system down. A lot of the ideas I was able to borrow from my walking commutes last summer. First of all, what do I wear when I bike commute? Luckily my commute is short – about 2 miles each way. When I am walking to work, I usually wear work-out like clothes, and carry my work clothes in my backpack to change in to. With biking, it only takes about 10 minutes to ride, and so far it’s been really cool in the mornings, so I haven’t gotten sweaty. So, I’ve been wearing my work clothes. Which I love – not having to change. I do wear tennis shoes, and different socks, just to keep my work shoes from getting wet or muddy. And my helmet. Always wear a helmet. 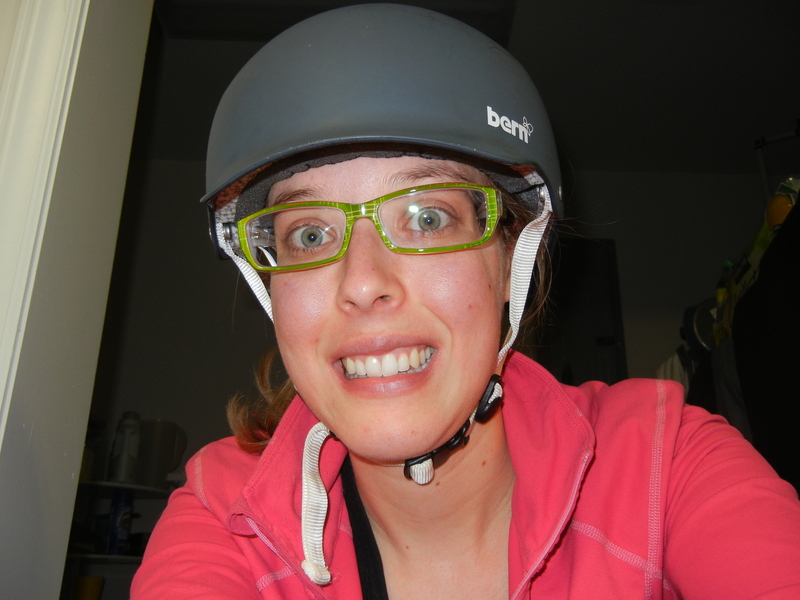 Mine is an older model Bern helmet, which has a snap in liner for cold weather, so I also use it skiing. So, what do I pack? 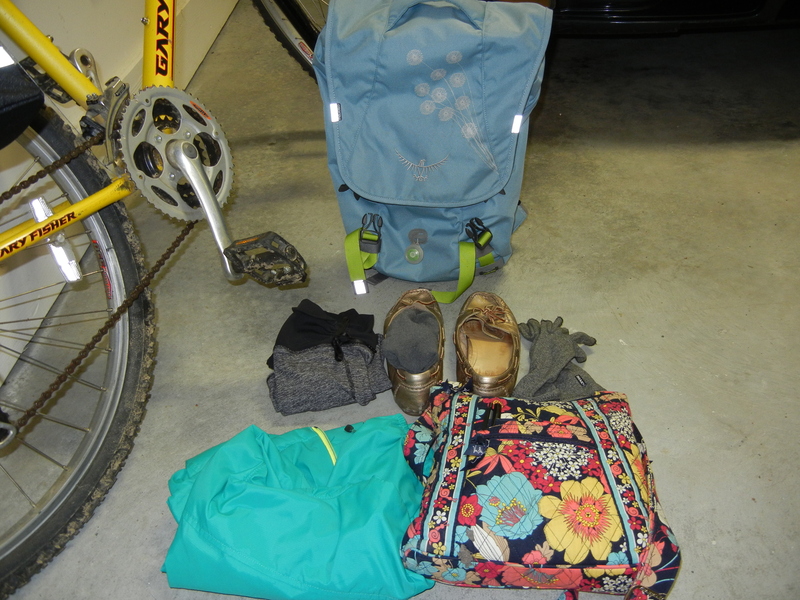 I pack in my Osprey backpack which I ADORE. (This is also the pack I walk with). In the backpack I have my bike lock, deodorant, my purse, my change of shoes and socks, my rain jacket (that I often wear on my ride in), LuLuLemon leg warmers (above the rain jacket) (these are awesome to slip on over my pants to keep my pants legs dry and out of my bike – sometimes I wear them, sometimes I just pack them – I tried to find them on the website to link and cannot), and my fingerless compression gloves – which I almost always wear in the mornings when it’s chilly because I have Raynaud’s. I also throw in anything else I need to take to work, such as food, etc. How Do I Carry the Backpack? The first day I carried it on my back, because I had just installed my bike rack and I was scared it would fall off (nervous nelly). But I quickly saw I needed more carrying capacity if I was going to be able to stop at the grocery which was kind of one of the big reasons for biking. 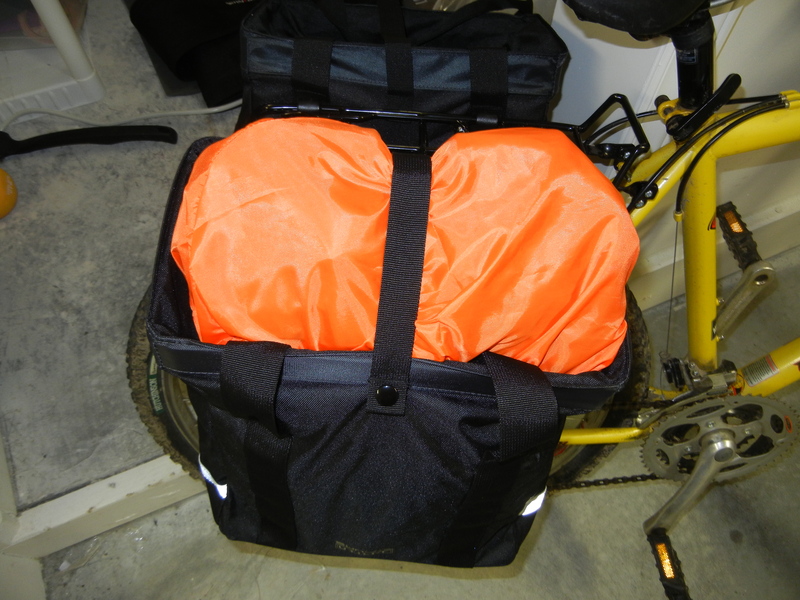 So, I ordered some pannier bags. I wanted ones that would still allow me to simply drop and go with my backpack, but leave room for groceries as well. 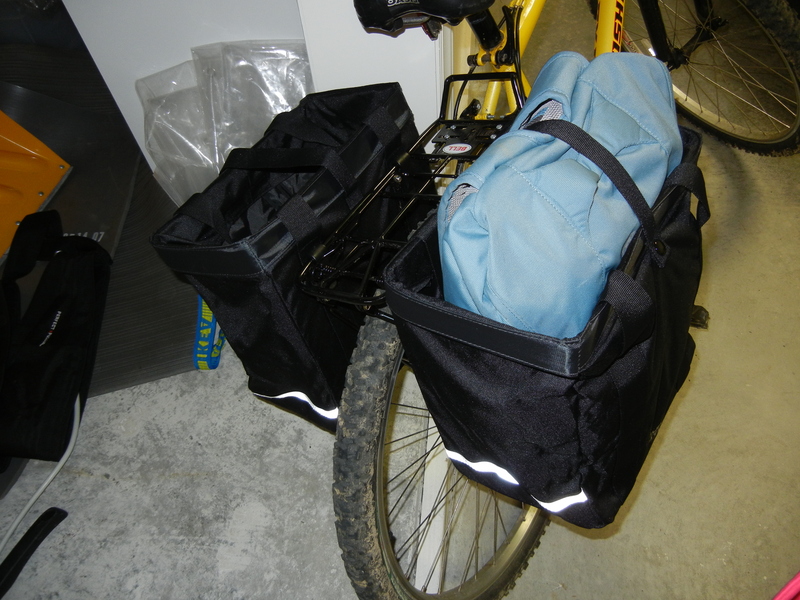 I found these – Sunlite Grocery Getter Panniers on REI clearance, and ordered them. They came today (after I got home from riding) so I haven’t officially bike with them yet, but so far I am impressed. 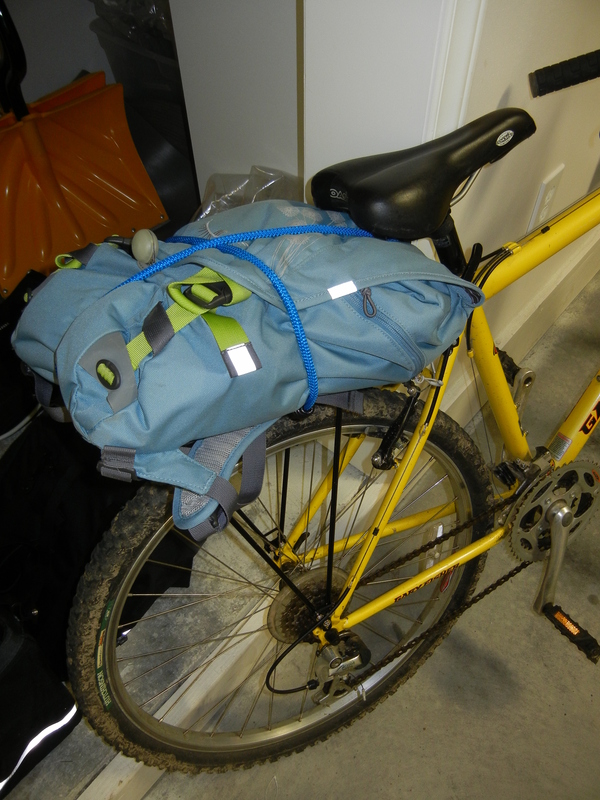 My backpack, although a bit tall, fits nicely, and the top strap did an excellent job holding it in during my scientifically official ‘shake the bike really hard’ test. I also have plenty of room in the other pack for groceries, or any other items I need to carry home. They also fold up and compress with a snap on the bottom, in case you want to stow them away. One thing that I knew before I ordered that wasn’t my total favorite, is that they have no type of closure at the top other than the snap/strap. I see now that my backpack wouldn’t be able to fit in with it zipped up, so I am a bit less concerned with that. I did order these dry sacks that were also on sale to put over the opening, in case of rain, and there is a small stow pocket that I can zip them into when I’m not using them. So, that is ‘How I’ bike commute. Updates and modifications to come, I am sure. But at this moment, I’m just mega glad it’s FRIDAY! Have you ever done any type of alternative commute? I’d love to hear your tips and tricks!